This post is specially written for you ladies but for the guys, there’s no harm to read it, okay? Hehe. I’ve been waiting to write this since some people asked me how do I take care of my skin, what products do I use and stuff. Those questions will be answered here. I don’t really invest so much money on very high quality products which are of course quite expensive due to my inconvenience to go to the luxurious places, also the money. Hmmm. Money play a huge role, guys. So I decided to do some try and error on the products available in the drugstores or any places which I can get them easily and the prices are more affordable. Surprisingly-orange themed, I introduced to you my everyday skincare regime! Wuhuuu. Lets take a look one by one shall we? Nourain skincare, the local (Malaysia) products has become my forever favourite since I started to use it last year. For the cleanser, Nourain came out with an orange-coloured soap known as Beauty Soap. The packaging is super simple which in a small square box with all descriptions written all over it. What I love about the packaging is that it has a small well on it that allow us to see what the soap looks like. Besides the box, there also another plastic container specially design for the soap. Just look at the orange thing. I love the design and the orange scent of it. Hehehe. I always cut the soap into pieces and used it one by one. WHAT I LOVE ABOUT IT? This beauty soap is super effective for all skin types especially oily skin like me. The effect takes place for about 3 days after used it then you can feel the difference. My skin gets better after I used it like become more soft and supple. The ingredients are amazing! Most of it are natural and no chemicals. Love it. The oil control is kinda great and I think that my skin become less oily than before. About more than a week, you can see the scars or any dark spots are started to disappeared. My big problem which is the whiteheads and blackheads are like 80% gone! The foam is so smooth and soft when you used it. WHAT I UGHHH ABOUT IT? The texture of the soap is too soft. I guess because the natural ingredients. You might wanna keep it in a very dry place or else the soap will become ‘soupy’ and can be easily drained out from the container. No worries. What I always do is keep the soap in a full-covered container. Even though the soap will turned into orange liquid, you still can used it like normal. MYR16 and would definitely repurchased it! Scrubbing is my favourite part of skincare routine. It feels like the reborn of your skin without any impurities, oil, dirt and all that disgusting stuff that don’t belong on your face. For me, it is very crucial. I put so much effort when it comes to choose face scrub, Previously, I’ve been using the facial scrub from Safi Balqis White Trilogy for oily skin. Unfortunately, the product was not looks like a scrub. The texture is more like a normal facial cleanser with very subtle beads that can be easily smudges together with the creamy part. I don’t like that. I want a functional scrub with long-lasting granules in it. So I decided to buy St. Ives Apricot Scrub specifically for blemish control and pores minimizing. One tube contains 170g of products which is quite a lot. The size also satisfying. Not too big or small. Came in a normal squeezed-tube form container which is the same as other brands. I love it. I’ve decided to get this St. Ives Apricot Scrub after I watched Maria Elena’s video HERE on what products she used in her skincare routine. She said that she used this scrub EVERYDAY. Wow. This is exciting. All I know that we can only scrubs like 2-3 times per week but she said this is a mild scrub and can be used for every single day. This is a bonus! Now I can get newly fresh skin like all the time. Hehe. But what I do is I scrub alternately and not everyday. The overstay granules or beads function so well in assisting me to get rid off any dirt and excess oil on my face. A very little amount of it is enough for your entire face. My skin feels fresh and super soft after used it every time. Reasonable price and easily available in almost every drugstores. I love the fact that this scrub is 100% natural exfoliants and oil-free. The apricot scent is a little bit strong for me even after you already washed and dried your face. MYR19.90. Its probably on sale the time I bought it and I think the normal price is MYR20 something. Would repurchased as long as I don’t find any better facial scrub. Hehe. I don’t really concern in choosing facial toner as long as they are alcohol-free. For me, all toners are all alike.The functions is the same. So since I’ve been using Nourain for quite some time, I decided to try theirs. I really love the packaging. It seems that they really put much thoughts and efforts designing this kind of container for a facial toner. It came in a really sturdy plastic bottle with cap and it is a spray-form of container. It looks like a pump but it is actually a spray pump. I’ve used this toner for quite a long time so I already throw out the packaging box. Hehe. But here some details about the product. The packaging is super convenience. You just have to spray the toner on your face without the need to drain it out onto a cotton pad. The toner is purplish-pink in colour and it smells amazing. I don’t really sure if it is effective in removing makeup or dirt on my face. There’s no positive effect yet for my large pores. MYR30. Repurchased? Maybe not. The price is pretty expensive for a toner. Nourain skincare does have a day cream but it more like a UV+Foundation cream. With my skin condition which is oily and has large pores, I don’t think foundation form of day cream would worked for me so I don’t buy it. I’ve tried once but yeah, my skin become more greasy and who wants that? So I decided to try a moisturizer that specifically formulated for oily skin. I’m glad that I find this affordable thing. It is quite hard to find the most suitable moisturizer for oily skin not to mention water-based. Some people might think that oily skin doesn’t need moisturizer but I think I do. This is an oil-control face lotion moisturizer from Safi Balqis White Trilogy. This face lotion is incredible. I love the cylinder-shaped packaging which seems pretty handy. Another pump! Yeah. I love it. No need to get your hand in mess putting it inside a bulb container of moisturizer like others in the market. Just pump it onto your finger and directly apply it on your face. Made for oily skin, the water-based oil & acne control moisturisng lotion SPF15 – SAFI BALQIS White Trilogy purveys extra moisture to the skin while controlling the skin from the threats of excessive oil production and acne problems. Enriched with the goodness Vitamin C and B3, it helps protecting and rejuvenating the skin cells from deep within while imparting perfectly bright skin without any harm. It is like other moisturizer, white and creamy texture. Easily absorb into the skin and yeah one points for that! Absorbed easily leaving the skin softer than before. I used it as makeup base and it is great. It is water-based so it suits my skin type perfectly. The oil control is quite okay la. It has SPF15 for UV protection. My skin become more smooth, fair and radiant. Sometimes it feels a lil bit greasy after a few hours but still under control. Hehe. Less than MYR20. I really can’t remember the exact price. Repurchased? Absolutely! I save the best for the last. Again, Nourain really had caught my intention. Before this, I just cleanse my face before go to bed without night cream or any other products but when I used this for the first time, my skin gets better and better! The packaging is super simple with a box and a small bulb plastic container full of 10g of night cream. Opening up the cute container, there is a white plastic cover protecting the cream from spilled and smudge around the cap. Keep it sanitized! The wax-like cream texture is actually like petroleum jelly. It looks greasy but believe me, it is not. The best night cream I’ve ever used! My skin become so soft in the morning and if I have any breakouts, this cream will take care of it. NOT OILY AT ALL. It looks oily but its actually not. Small amount able to cover the entire face. I think this cream is the one that helped my skin a lot. Can be used like 2-3 months per container. The blemishes, whiteheads, blackheads, scars are gone. For me the price is pretty steep but I guess its worth the functions. Only can be easily applied if your skin is moist and not dry. MYR40 for 10g. I don’t really sure the price for the 5g. Definitely repurchased! Phewww. Such a long post. So now you know the products I’ve been currently used and all of them are amazing. Who says cheaper brands are not so good? Finally, I managed to finish this and hope it helps. I bought online for the Nourain skincare and the others from the drugstores such as Watsons and Guardian. You can read another follow up review for Nourain skincare HERE. Another review? Yeah. I already told you that I’m gonna do a reviews marathon this week. Hehehe. I don’t know why but I love to share products or anything that I’m using so you get the idea to buy it or not. Andddd today I would review my new skincare regime that I’ve been using for like a month now. It is Nour Ain Beauty Care Trial Set 3 in 1! It has been in the market for like a few years but still everybody keep raving about it until now. It is a local product (Malaysia) and 100% made by Bumiputra and halal which is yeah, I’m going to put it in my must-buy list. Another thing that keep attracting me to use this is that the base and main content is from natural ingredients. Mother Nature is always number one! You may read the descriptions and details on the back of the box both in BM or English. Consists of 3 main products which is the Beauty Soap, UV+Foundation Cream and Night Cream. As I know, the natural ingredients being used are virgin coconut oil and olive oil. That is why my skin feels soft and radiant every time I used it! Removes excessive production for radiant fairness. Suitable for both sexes, teenagers and adults. For me, the soap is the best cleanser I’ve ever used. I am serious. I am not piling on any marketing strategies or sponsored post but I’m telling the truth based on my experience. The orange scent makes me feel that I’m now cleansing my face with an orange skin. It feels more natural in its own way but there is something that you should know. Well, the base is from natural ingredients so the soap is a little bit soft and may I say, it is kinda mushy. You MUST keep the soap away from any damp and watery surface as it may transform to the liquid version. Luckily, my liquid Beauty Soap doesn’t leak away from my soap container. Just find out an alternative, I quickly bought a small tube plastic travel bottle to put all this soap in and yeah, I can used it like a normal facial cleanser now. Next, is the UV+Foundation Cream. Came in 10gm of product is a little bit too much for me because I don’t really like to apply any foundation onto my oily skin but it doesn’t matter now. I love the texture and I must say it gives a full coverage and I just need a little amount of product to achieve that. Suitable for all type of skin. The texture is non-oily and it is very light when applied on the skin. I love it! I always used it as my makeup base or sometimes I just apply it alone. The smell is a natural scent without any fragrant or chemicals smell. It is a good deal, guys. The cream is a liitle bit pinkish but when I apply it evenly, it covers almost everything. It absorbs well and blend to my skin better. Finally, I save the best for the last one. The Night Cream! This product is so small that I could put it in my mouth. Hehe. Came in 5gm of product and I was like, seriously?? Just 5gm? I wish they could repackaging it and came out with 10 – 15gm of this cream. Why? Because this is the BEST NIGHT CREAM EVERRRRRRRR!! I am not a very scheduled and disciplined person to wear night cream, serum and so whatever but this? I think I would put this night cream all day long even during the day. For the very first time ever in my life, I’ve found a NON-OILY and creamy night cream. Its true! Not oily AT ALL. The texture is more to a paste-like and not creamy. More like petroleum jelly I guess. It is quite sticky so I always apply it when my face is damp. If your skin is dry, you may have some problems to apply it evenly. My skin looks fairer and soft than before especially in the morning after the night cream session. Whiteheads problem 90% go away. My skin become less oily than before. I guess there is nothing that I can give a thumbs down to this product. WHERE TO BUY AND HOW MUCH? You can buy them online directly on Nourain website or any online sellers in FB, Instagram or even Twitter! The price is quite reasonable for only RM54 for S.M. and RM59 for E.M.
Hope you can check them out! There also other Nourain skincare set with toner, serum etc. 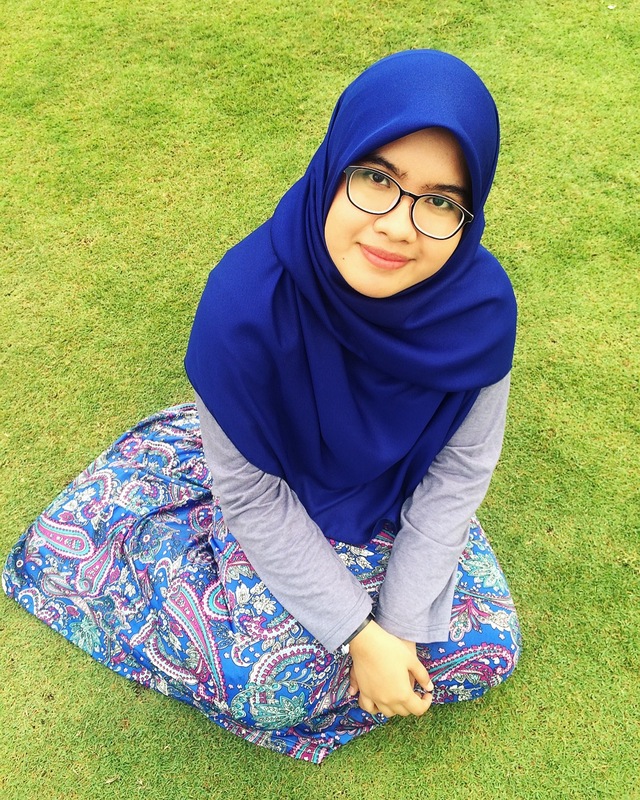 A postgraduate of Bachelor in Science (Hons) Biomolecular Science in UiTM Shah Alam. Nak buat slide presentation yang super awesome ?